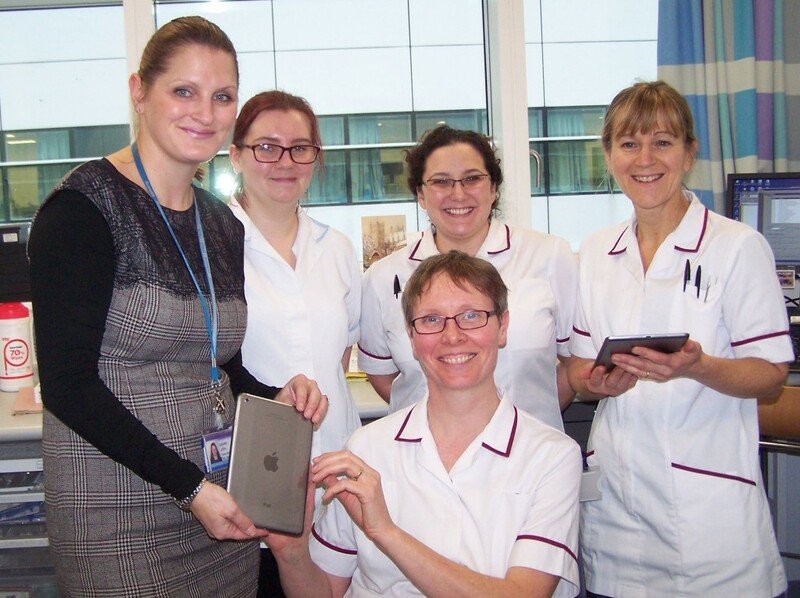 In the first of a new series we bring you the story of how Grants we have award to the Speech & Language Department at the Queen Elizabeth Hospital, Birmingham are helping head and neck patients. Katrina, a Speech and Language Therapist working within the Head and Neck/Oncology team at Queen Elizabeth Hospital Birmingham says: “Treatment for head and neck cancer may include surgery and/or oncological treatments such as radiotherapy or chemotherapy. These treatments may result in physical, emotional and psychological problems. It is common for people to experience swallowing and/or speech and voice problems from the point of diagnosis, for the duration of, and beyond the completion of the treatment. I was very fortunate to receive funding from Get A-Head to attend a course at Imperial College London from 7th – 11th March 2016 on Laryngectomy: Rehabilitation and Surgical Voice Restoration. Attending this course has improved my knowledge and skill base in my daily clinical practice working with patients who have cancer of the throat and undergo a laryngectomy operation. The first option, known as surgical voice restoration, involves making sound by voice prosthesis and tracheo oesophageal puncture (TEP) and is the most common way to restore speech after laryngectomy, but it is not suitable for everyone. The TEP is created as part of the operation to have the larynx removed or it can be done as a minor operation at a later date. The voice prosthesis is placed within the TEP, and is a valve that allows sound to be made by pushing air from the lungs through the valve and up into the mouth. 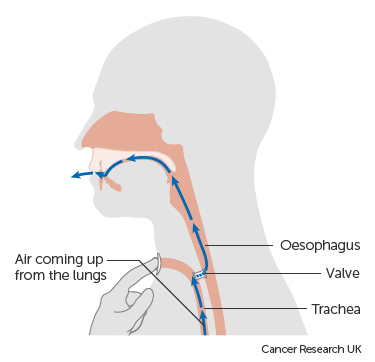 When the stoma is covered air goes through the valve and not out of the stoma and voice is produced by vibration of the muscles at the top of the oesophagus. Having a voice prosthesis fitted and learning to use it takes practice and an understanding of how the voice is produced. The Laryngectomy Rehabilitation and Surgical Voice Restoration course has provided me with the opportunity to develop problem solving skills to work together with patients to maximise their voice and swallowing following surgery. The second option Augmentative and Alternative Communication (AAC) describes ways of helping patients who find it hard to communicate by speech or writing. An alternative method to achieve a sound after laryngectomy surgery is an electronic larynx (electrolarynx). This is a battery operated machine that produces sound to create a voice. There are many different makes and types, but they are usually about the size of a small electric razor. The machine is held against the neck, or a small tube is fitted into the corner of the mouth. When a button on the machine is pressed, it makes sound. And when the tongue and mouth move sounds are formed into words. This method of speech after laryngectomy may be best if the patient is not able to have a voice prosthesis (TEP) for medical reasons or did not have a voice prosthesis put in at the time of the laryngectomy but is waiting to have one put in later. The speech has a mechanical sound to it but most people can make themselves understood. Training from a Speech and Language Therapist and plenty of practice is needed to be able to use this method effectively. These Electrolarynx however are for single patient use and expensive and Get A-Head has kindly purchased many over the years for QEHB and other local Trusts who have been unable to fund them for their patients.